Charlotte’s Ary Hicks attempts a basket during the Tarpons’ home game played against Riverview. Charlotte improved to 17-6 with a 37-27 victory. SUN PHOTO BY JENNIFER BRUNO Charlotte’s Bella Desjardins takes a shot over the reach of this Riverview defender. PUNTA GORDA – Bella Desjardins scored 13 points and the Charlotte High School girls basketball team rallied in the second half to defeat Riverview 37-27 in the final regular season home game for the Tarpons on senior night. It was a night for the seniors to shine, and the six Tarpons played a huge role in the game, with five of them starting and Desjardins sitting on the bench for the entire first quarter. It was their reward for four years of hard work, which for them started with a different coach and with them having to earn their way by playing junior varsity. Riverview (10-12) dressed only seven players and was able to hang tough for much of the game thanks to Diandre Slusarek, who led the Rams with 12 points. But if there’s one thing Charlotte (17-6) is good at, it’s winning ugly. 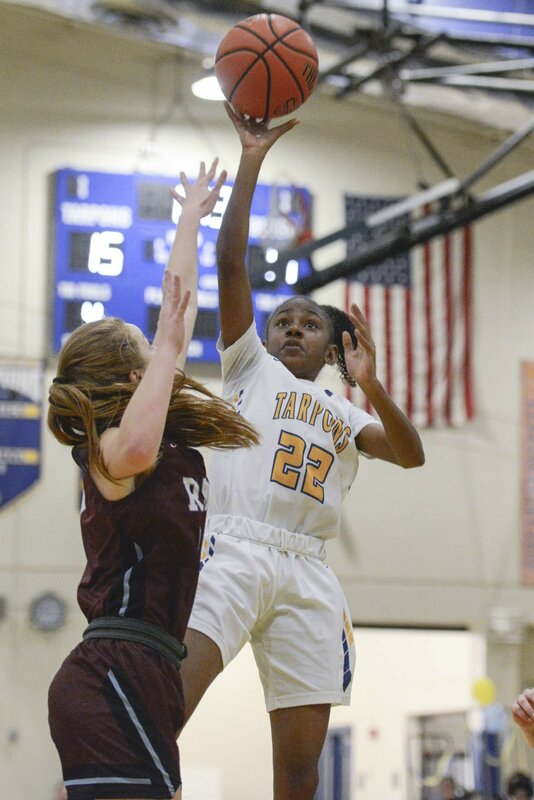 And the Tarpons were able to take control in the fourth quarter as their 3-point shooting, cold all night, finally got going as Desjardins and Vanessa Vicente hit shots from behind the arc to break the game open. Of course, it was the defense, which has been the bread and butter for Charlotte, that won the day as it allowed just seven points in the fourth quarter and no 3-pointers the entire game. Vicente said her experience as a Tarpon is something she will always remember. “I’m just going to remember the team. We were really nice to each other, like family, and we did our best,” Vicente said. Azuree Pascal also came in as a freshman (and was named MVP of the JV squad), and like Vicente has experienced success and lots of fun along the way. Riverview (27): Diandre Slusarek 12, Boehm 6, Dean 6, King 2, Windsor 1. Totals: 12 3-9 27. Charlotte (37): Bella Desjardins 13, Moses 7, Pascal 3, Vicente 3, Anthony 3, Joseph 2, Jackson 2, Hicks 2, Carter 2. Totals: 14(2) 7-14 37.